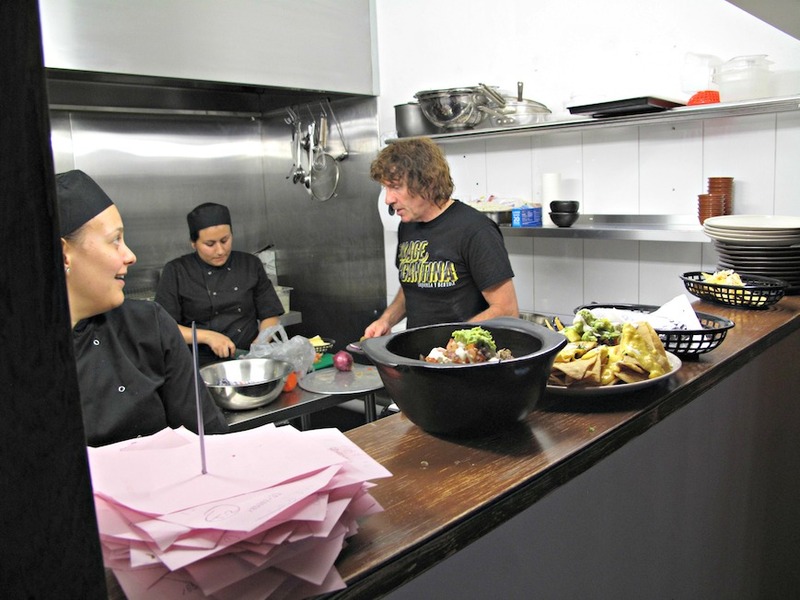 There was a definite ripple of excitement that hit the inner west as it became know that a Mexican chicken joint would stepping up to take over the premises formerly inhabited by Burger Business. Somehow – between checking out the business’ Facebook page and website, and then talking with a few folks – I convinced myself that Los Pollos was part of a franchise deal. It seems that is not the case, though it certainly looks the part if management care to move in that direction and move into other locations. They make their own corn chips, but when we ask, we’re told the tortillas are brought in. 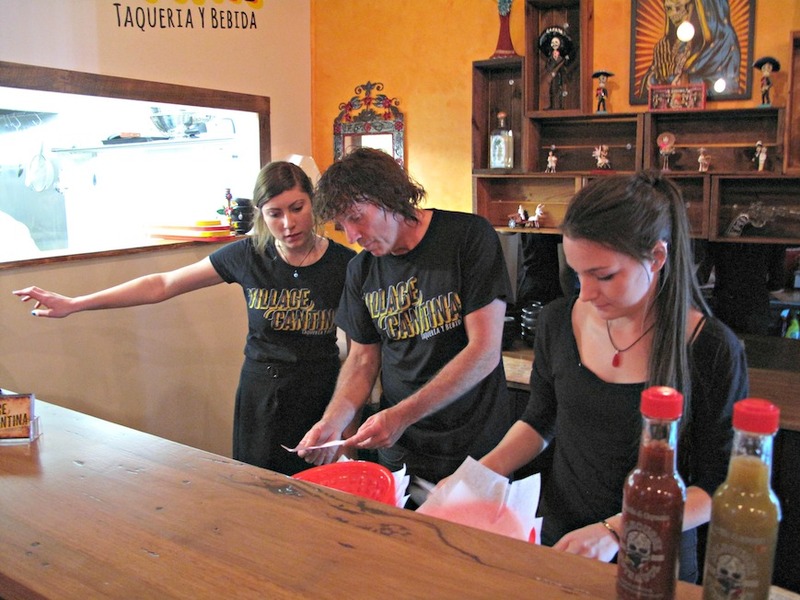 So how does it stack up – some real-deal Mexican tucker; or just another Tex-Mex place a la Guzman y Gomez? 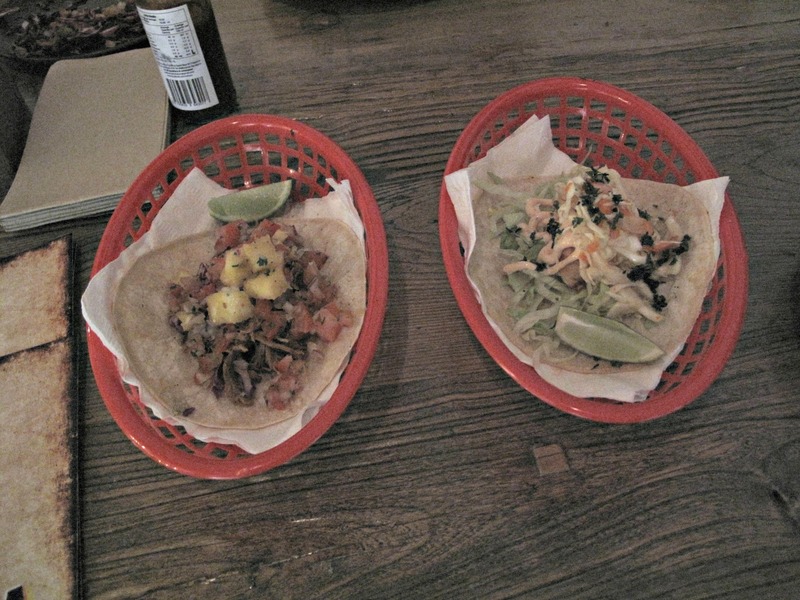 A big step up from Taco Bill – or on a par? Well, it’s definitely more Tex-Mex than La Tortilleria – and that’s fine by us. 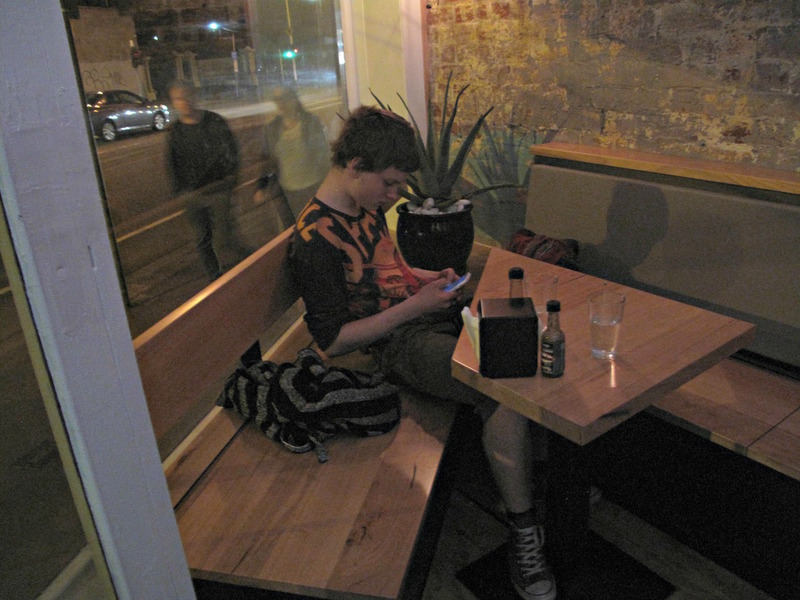 After we order, we adjourn to the lovely garden space out back. 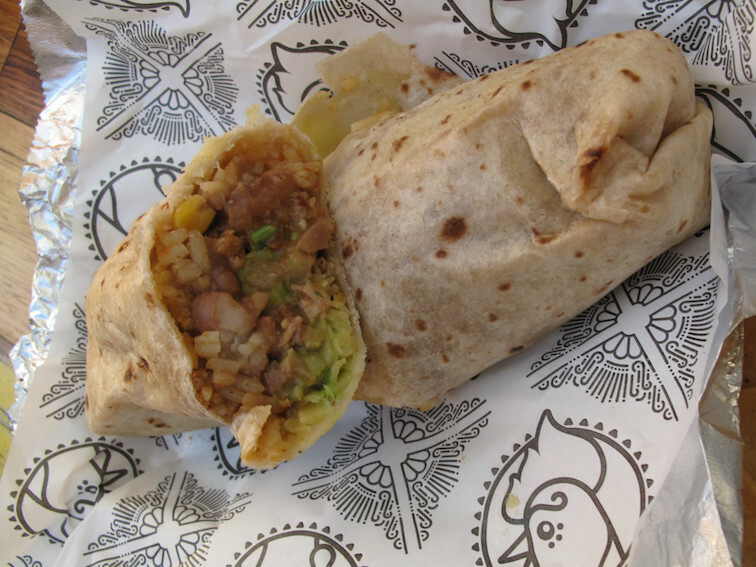 Bennie is very impressed with his Super LP Burrito with grilled chicken, rice, beans, salsa, queso tasty, pica de gallo, guacamole and jalapeno crema ($16.50). He offers his dad a taste, after which I, too, conclude this is better than similar offerings you’ll find at similar places elsewhere. And, yes, it eats bigger than it looks. It comes with a handful of corn chips. 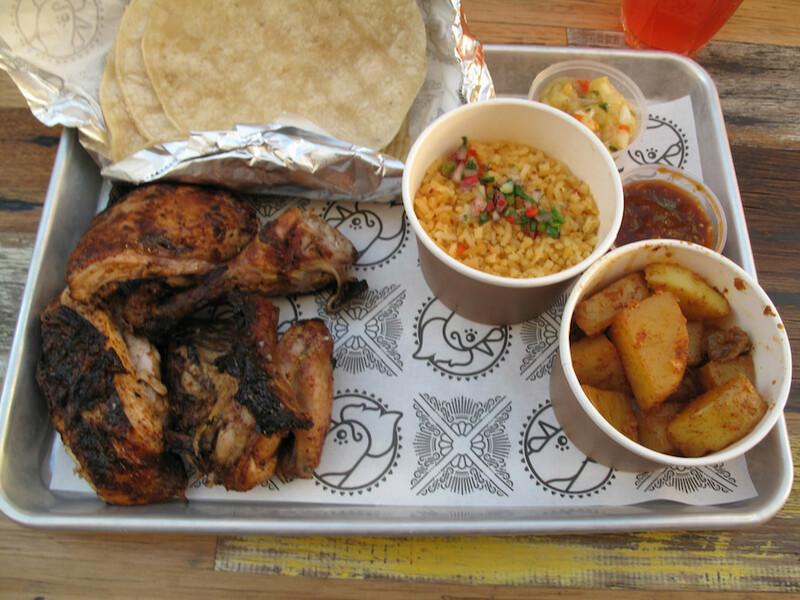 My half chicken combo with two sides, two salsas and six tortillas ($18.95) is more of a mixed bag. I like the chicken, even if it doesn’t provide the sort of lip-smacking joy for which I have been hoping. Bennie, after consuming a drumstick, disagrees with that modest assessment. It’s different – not Nando’s, not your average Aussie charcoal chook. The salsas are lovely – though having requested one medium and one hot, I find them similar in the heat/spice department. The sides – red rice and roasted potatoes – are OK, but on the lacklustre side. The word “roasted” led me to expect spud chunks with more crackle than has arrived. You’ll eat fine at Los Pollos, but it’ll pay to keep those expectations grounded. 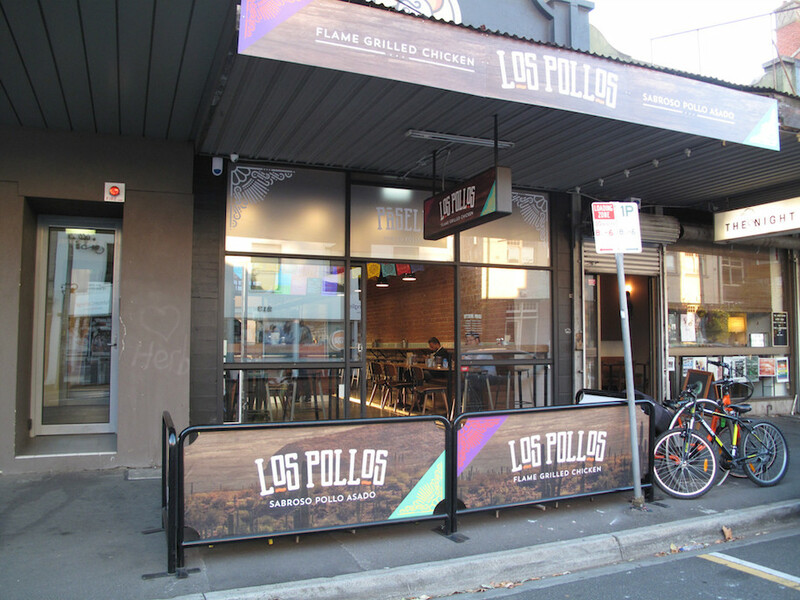 Check out the Los Pollos website – including menu – here. 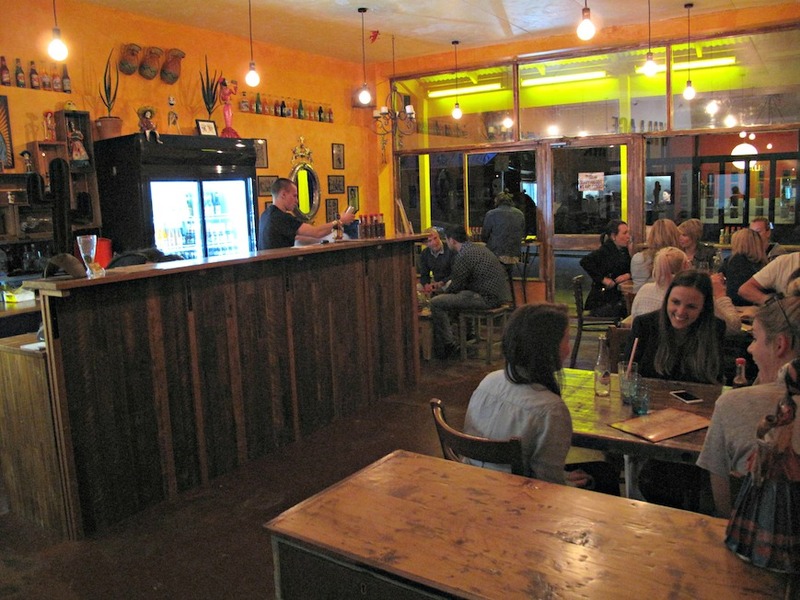 We’re in Point Cook for some Mexican food – or, more accurately – some Tex-Mex tucker. Our most recent adventure along those lines – on the other side of the freeway, at another shopping centre – had hardly thrilled us, so why our upbeat mood? Because Muyrico’s Rupantar Dey has approached us with a view to doing a review (see full disclosure below). We like his style and honest approach so we are quietly hopeful. That optimism turns out to be well founded. Rupantar and partner Gaurav Verma have a nice little operation going at Sanctuary Lakes shopping centre. The food is cheap and tasty. 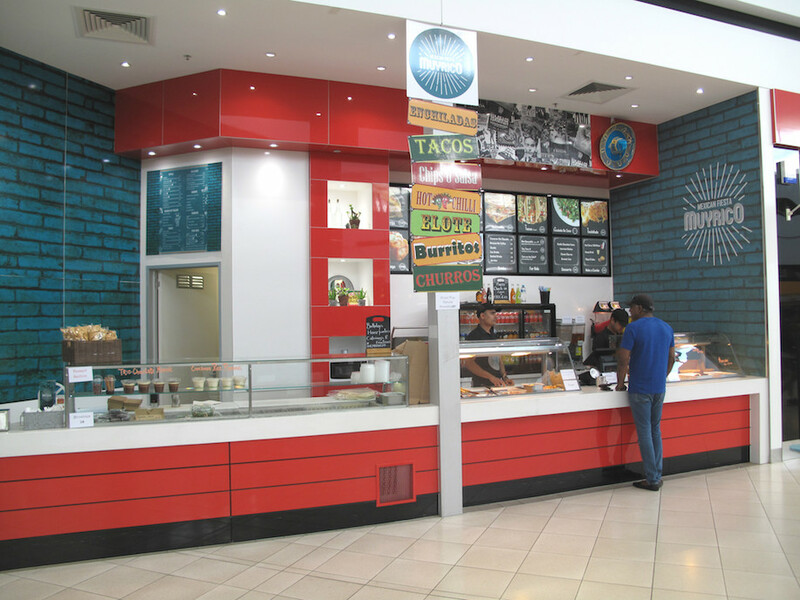 Keep in mind this shopping centre food court fare and a nice time can be had. 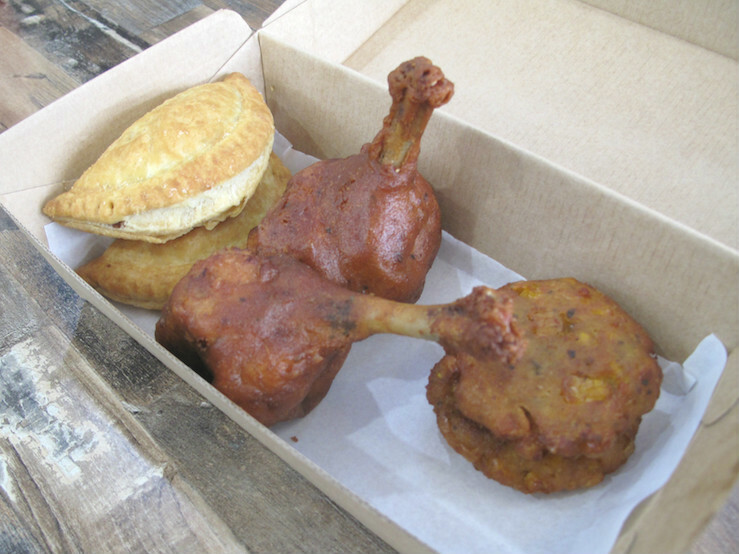 We start with a range of the lads’ snacky items – flaky pastry beef empanada ($1.50 each), devilled chook leg ($1.80) and corn fritters ($2.50 for three). The fritters especially impress – they’re simple, light, moist, chewy and corny, and much better than the very similar spring onion pancakes we sometimes try in Chinese places. 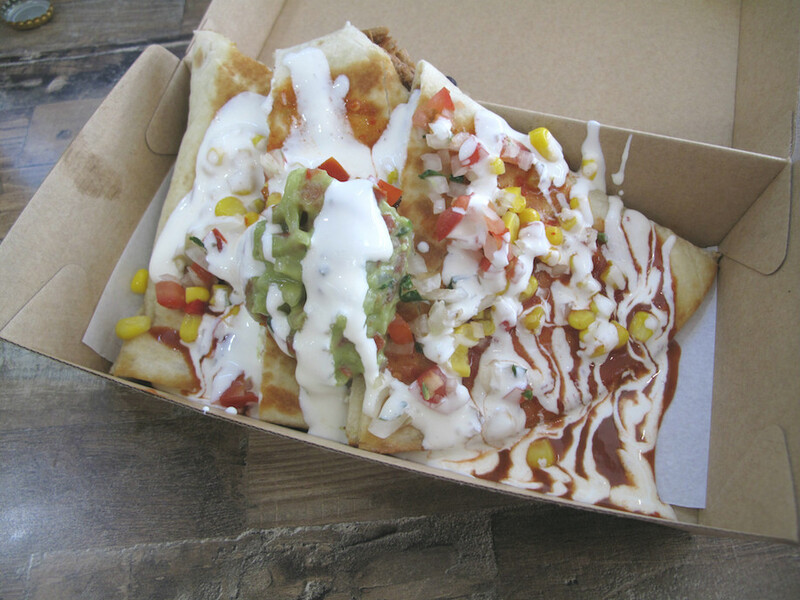 Our quesadila ($10.90) is a messy treat. The flour tortilla is toasted after being stuffed with pulled pork, cheese and beans, the whole lot then anointed with sour cream, guacamole, corn and tomato. Our chimichanga ($10.90) has a chicken filling, but in most regards this deep-fried burrito shares much with our quesadila, only it’s a bit more stodgy. Kinda like a cheerful Tex-Mex take on an old-school chiko roll – and I suspect there’s folks for whom that description will be a big, fat green light! 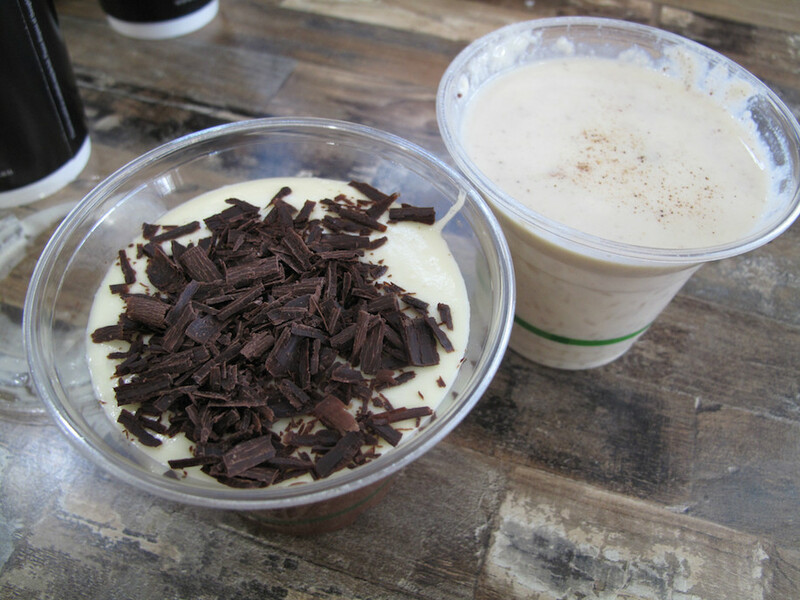 The chocolate mousse and cinnamon rice pudding ($6, but soon to be – I’m told – $4.50) are, as expected, sinfully rich – and with consistencies more like soup than pudding! 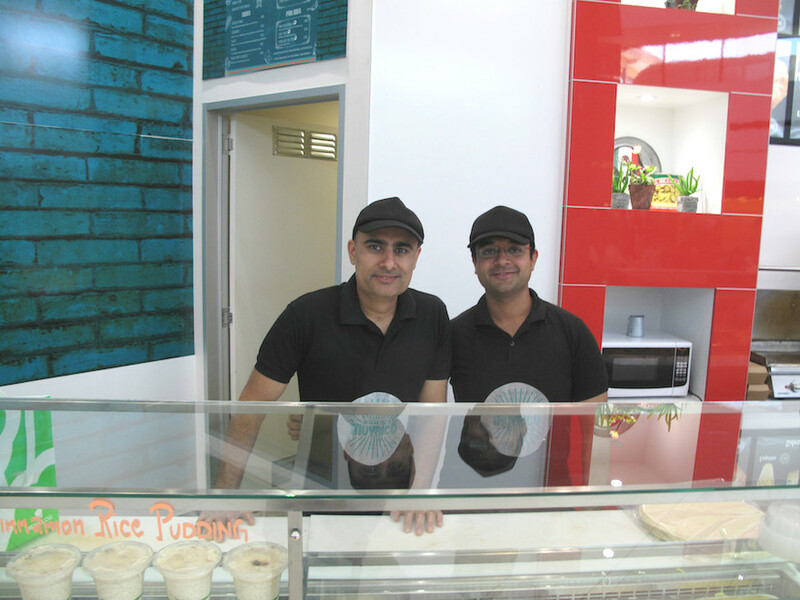 Gaurav and Rupantar tell me Muyrico is going good, though they’re still feeling their way to what works best for the demands of their location and customers. They’re especially pleased with their bustling home delivery service. 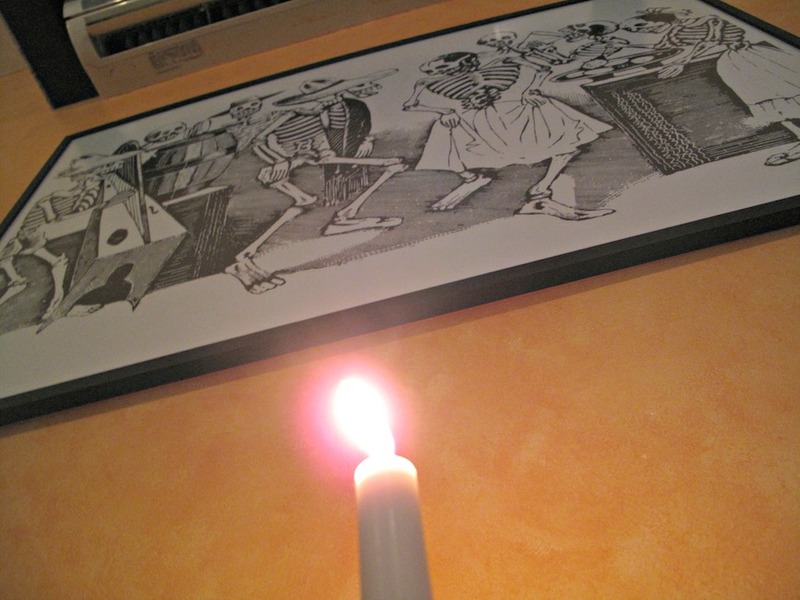 Muyrico is open until 9.30pm seven nights a week. Check out the Muyrico website here. 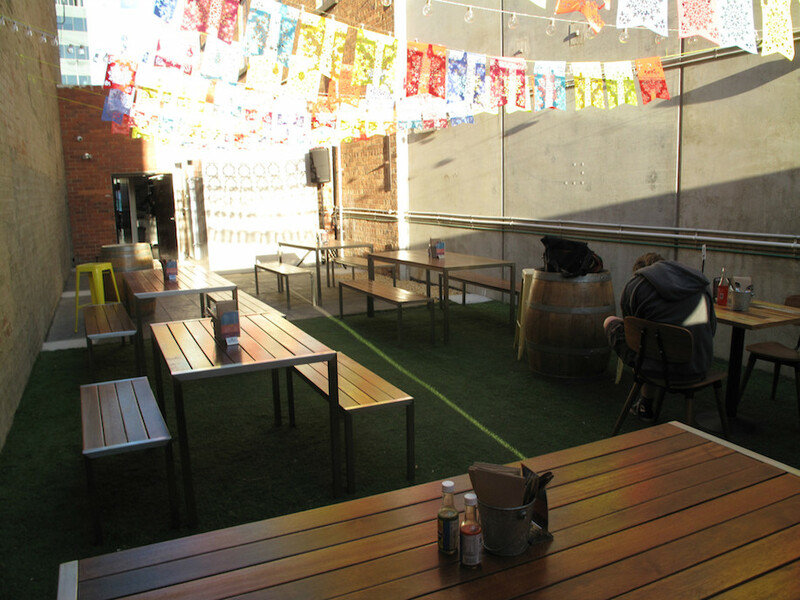 This year, CTS has indulged in a couple of meals at Melbourne Mexican restaurants with reputations for authenticity. Such are the continuous, unstoppable, nifty ways humans operate that “authenticity”, when soberly analysed in just about any setting (food or otherwise), is seen to be something of the ultimate straw man. Still, we were surprised just how little “wow” we found in those meals. Maybe true blue Mexican is simply not for us? And, gosh, tacos that amount to little more than a couple of mouthfuls can, over the course of a hungry meal, add up to more dollars than expected. 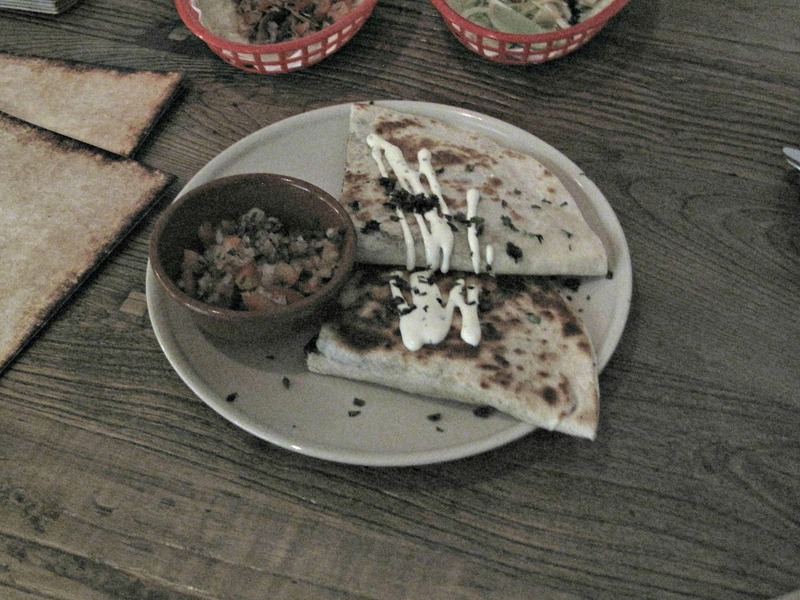 We were forced to acknowledge, somewhat to our surprise, that we actually may prefer the hybrid food usually referred to as Tex-Mex and as served rather well – we think – by our local. So we are quite happy to rock up to Montezuma’s at Williams Landing. 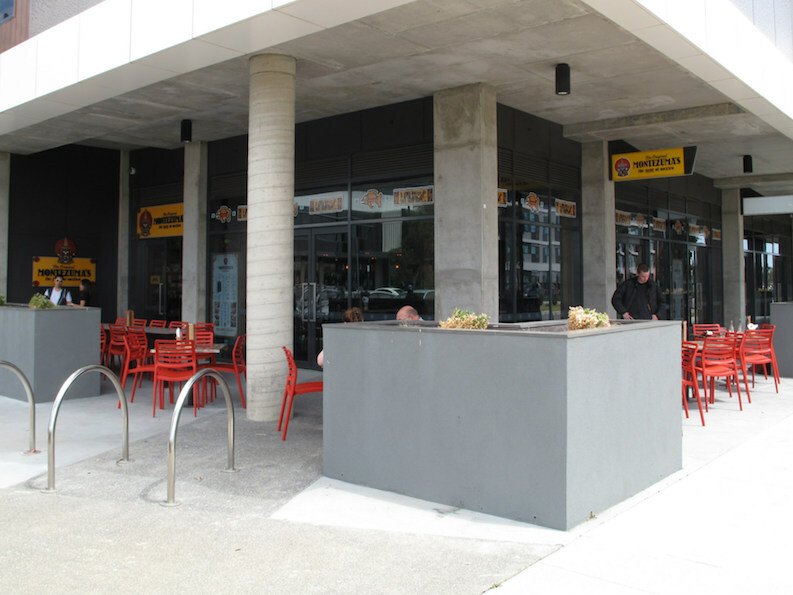 It’s part of a franchise deal that has close to 20 eateries around the country, though this is the first in Victoria. It’s located around the corner from the Williams landing shopping centre itself, and right next door to an also-newish Chinese place we have yet to check out thoroughly. 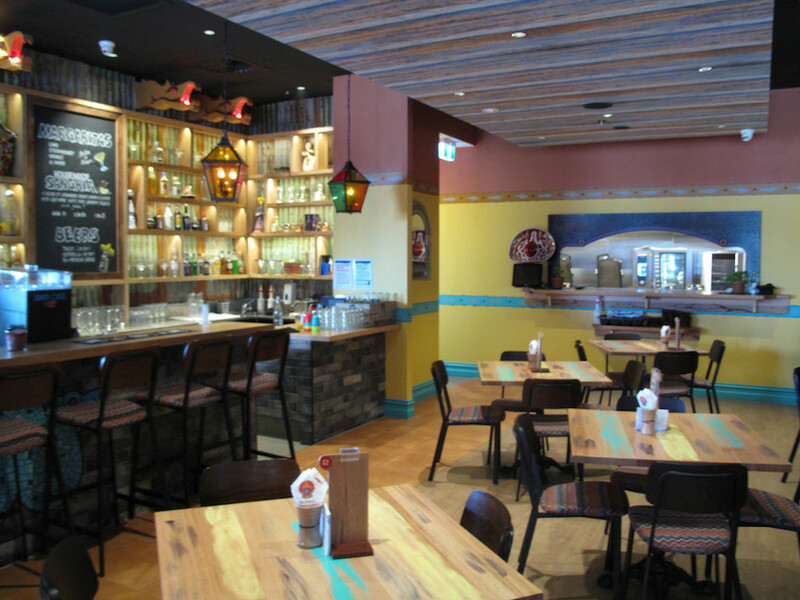 Montezuma’s is decked out, inside, in a predictable fashion and looks inviting in a familiar way. But it’s a nice sunny day so we choose, for once, to go alfresco. 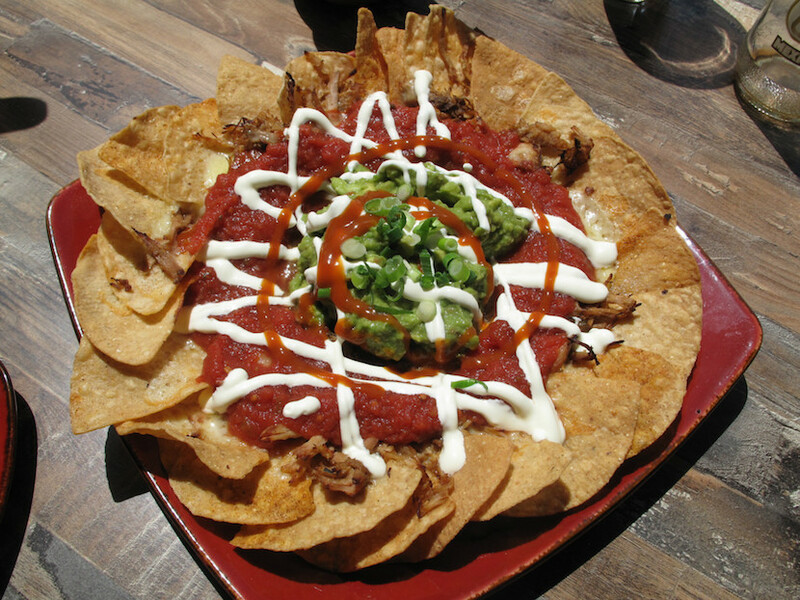 Bennie’s full pulled pork nachos appear rather hum-drum and are up there in price at $19.90. But they work well and he enjoys his meal. And there’s a heap of very good pulled pork – better than served in many non-barbecue specialist places – under all the usual trimmings pictured. 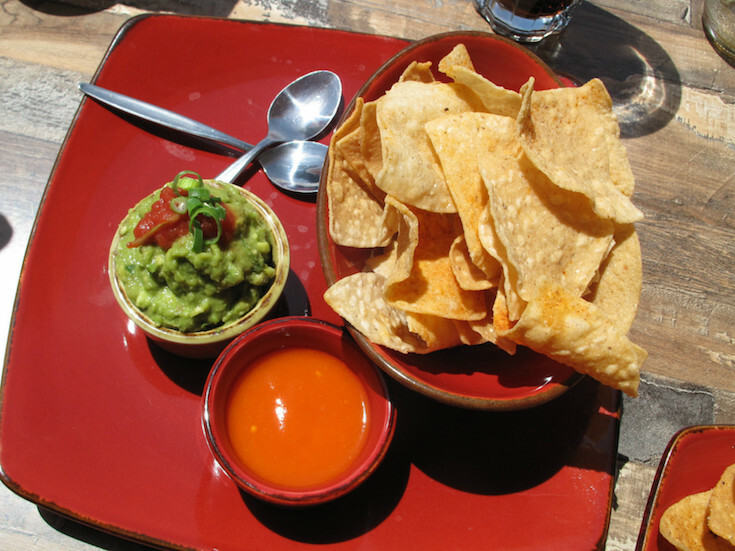 A side serve of guacamole ($4.90) and corn chips ($3) are just OK, but we are surprised we have to request hot sauce for our table when we have become so used to having a range of saucy bottles already provided – at all sorts of eating places. 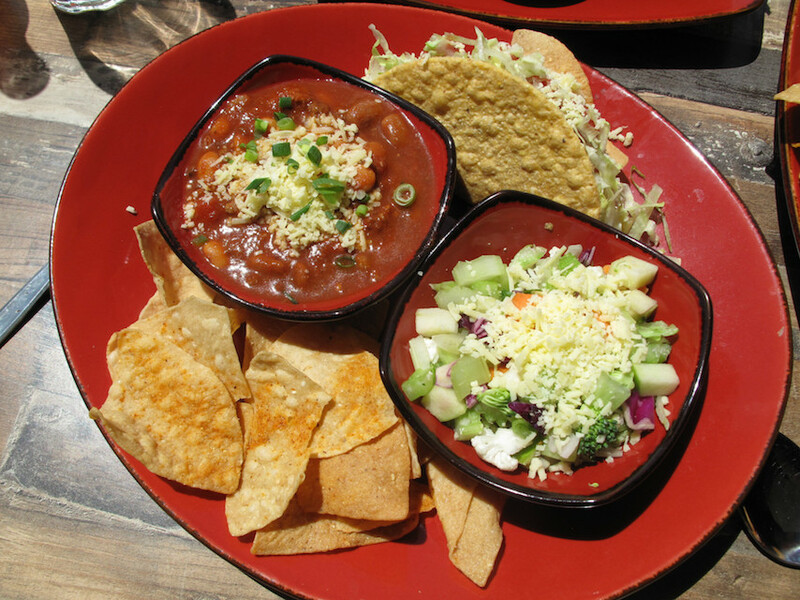 The Montezuma’s menu is extensive and there are many combinations to be had. 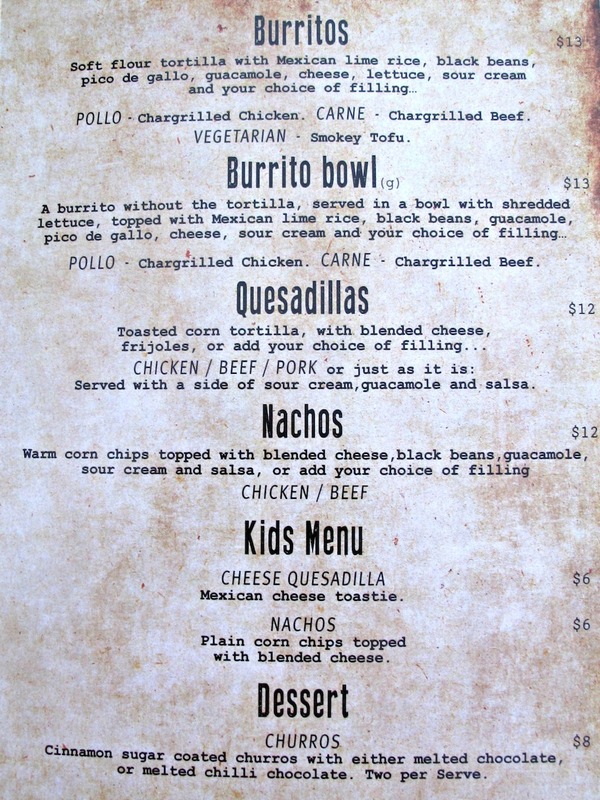 Mine, the #17 Speedy Gonzales, costs $19.90 and comes with a beef taco, chilli con carne, corn chips and salad. All is perfectly edible, but there’s simply no zing. The chilli con carne is particularly lame. Maybe it’s from a fresh batch, but the beans, meat and gravy in no way coalesce. Worse, that gravy tastes all tomato and no seasoning; no appreciable tang of salt, pepper, chilli, cumin, lemon or anything else. My taco is of drab food court standard, while the salad is the best of my meal. 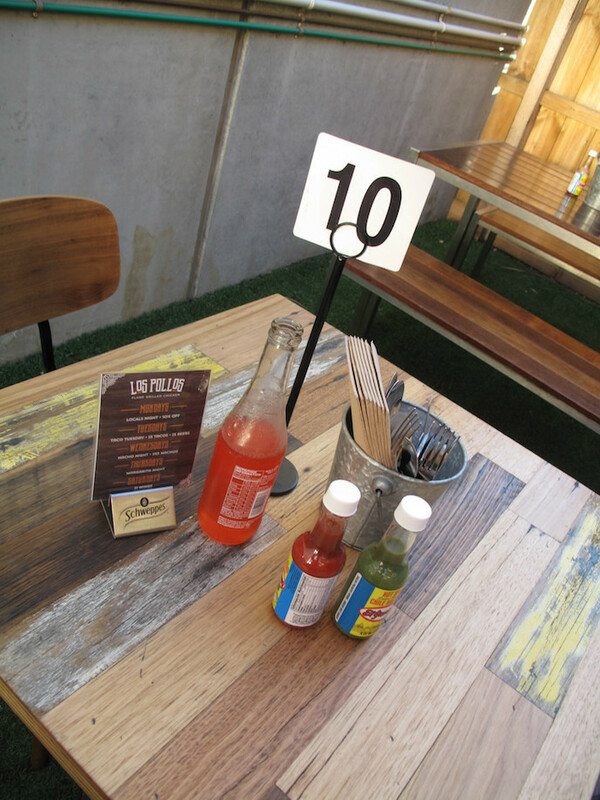 A couple of bottles of Jarritos soft drink have pushed our lunch-time bill out to the $60 mark. And that seems quite a lot for a meal that will be hastily consigned to the most deeply buried files in the CTS memory bank. Maybe we arrived with unrealistic expectations. 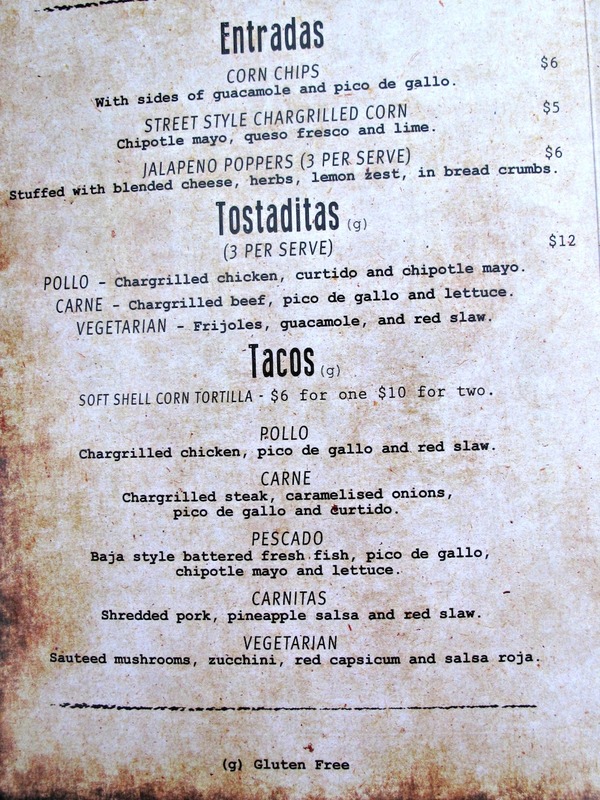 Check out the Montezuma’s website, including menu, here. 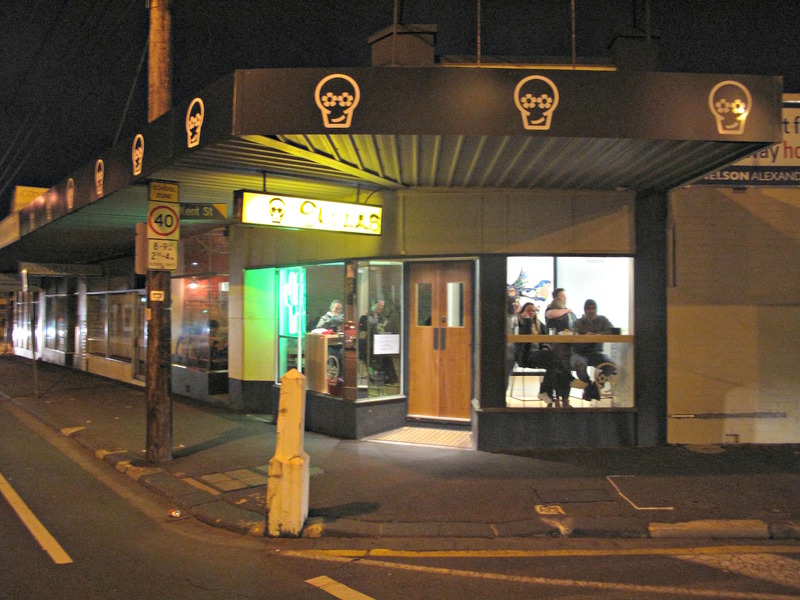 Sugar Skulls, 185 Mount Alexander Road, Flemington. 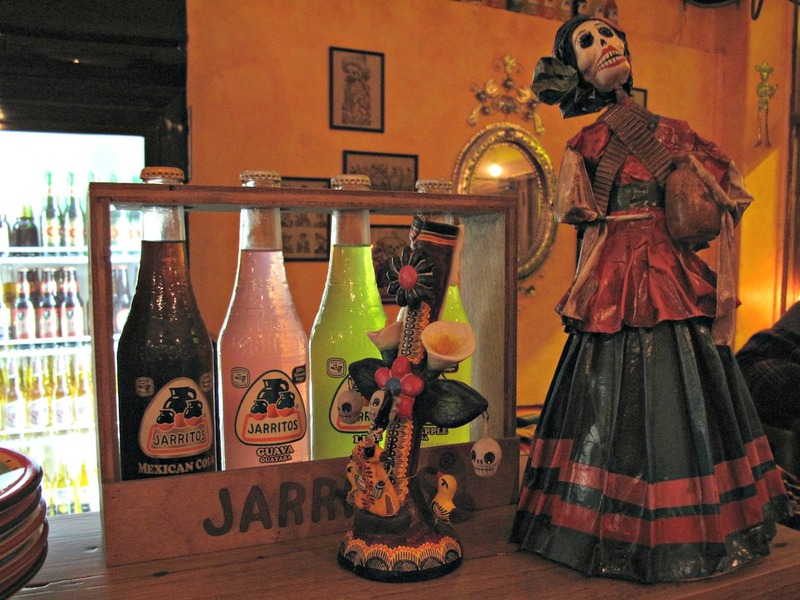 Sugar Skulls is located on lower Mount Alexander Road, right opposite the fine cafe that is Phat Milk and in a premises that was formerly occupied by a beauty shop. It’s been open about five weeks. We arrive early and hopeful on a Friday night. At first there’s a little confusion about whether, upon being directed to wait our turn at the serving counter, we’re in the house for takeaway or eat-in. That’s quickly sorted and we’re shown to a window table with the proviso we must be gone in 45 minutes. 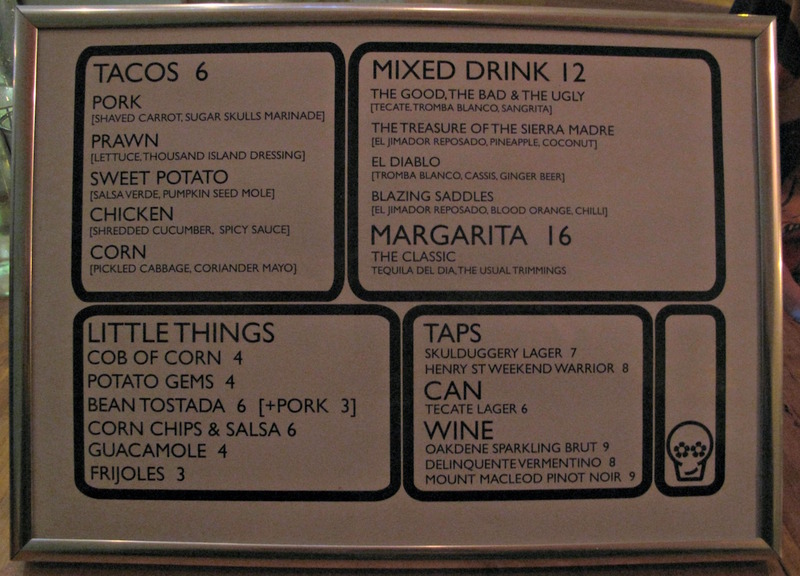 Sugar Skulls is a compact and classy operation, with a concise menu (see below) that encompasses food and beer, wine and mixed drinks. But there is a fast-food element to proceedings, so I’m not sure why they’re bothering with bookings – especially as there is no phone number provided on either their website or Facebook page (the website has a bookings facility through OpenTable). And certainly we make the 45-minute deadline with time to spare – this is some of the quickest food delivery we’ve ever experienced. That’s entirely appropriate for what is pretty much street food and we’re happy because we’re hungry. We order about half the menu. 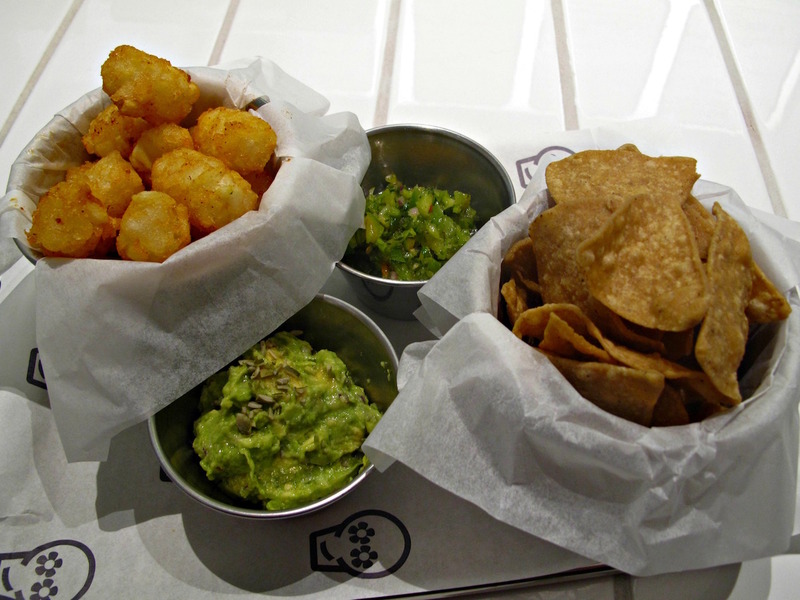 From the list of “little things” – potato gems ($4), guacamole ($4) and corn chips and salsa ($6). They’re all fine and very keenly priced – though I’m left wishing for a bit more spice and zing from the rather bland salsa. 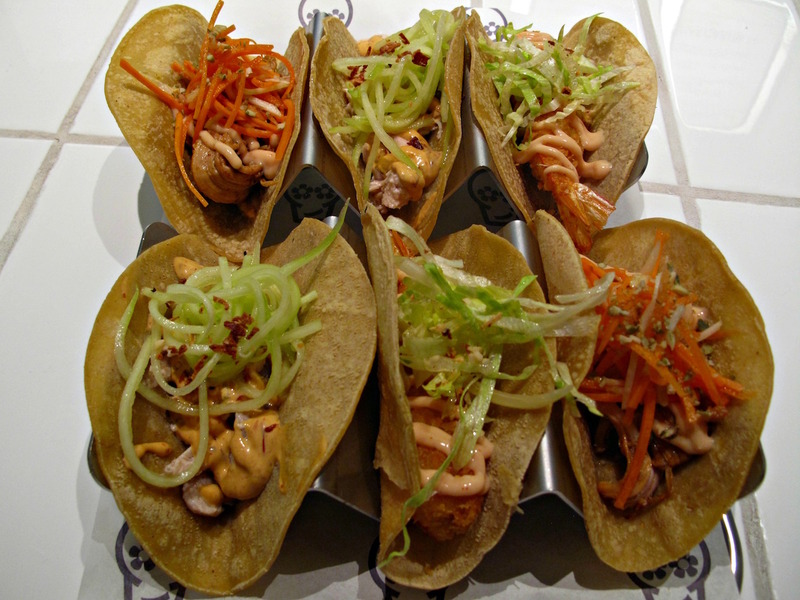 Much the same could be said of our tacos – we order two each of the chicken, pork and prawn at $6 a pop. They’re lovely and fresh, and each has its own distinctive dressing and adornments. We especially like the tempura-like vibe of the prawn outings. But, yep, I wish for a bit more ooomph in the chilli/lime/lemon/salt department. Mind you, there is a nice range of hot sauces on hand if that’s your wont. We use a couple of them to slather on the extra serve of corn chips we order – both the chips and the tortillas come from nearby La Tortilleria. That takes our bill for a satisfying, drinkless meal to a fine $54. 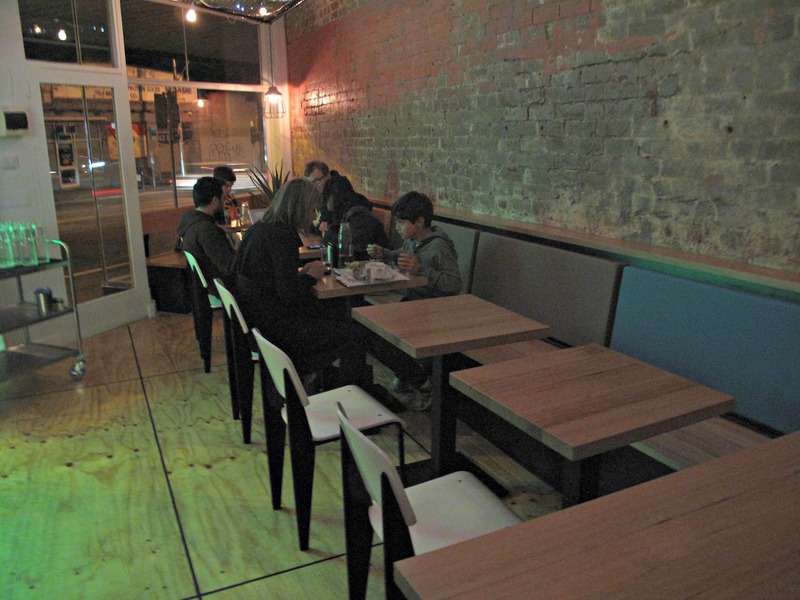 It’s been six months since Consider The Sauce’s first visit to the then newly opened Village Cantina in Yarraville. I’m happy to return, especially as Bennie has yet to do so and it fits right in with our mid-week nothing-planned-for-dinner situation. Without intending to make such a direct comparison to that first visit, we end up ordering two items had on that occasion – and it’s something of a revelation. 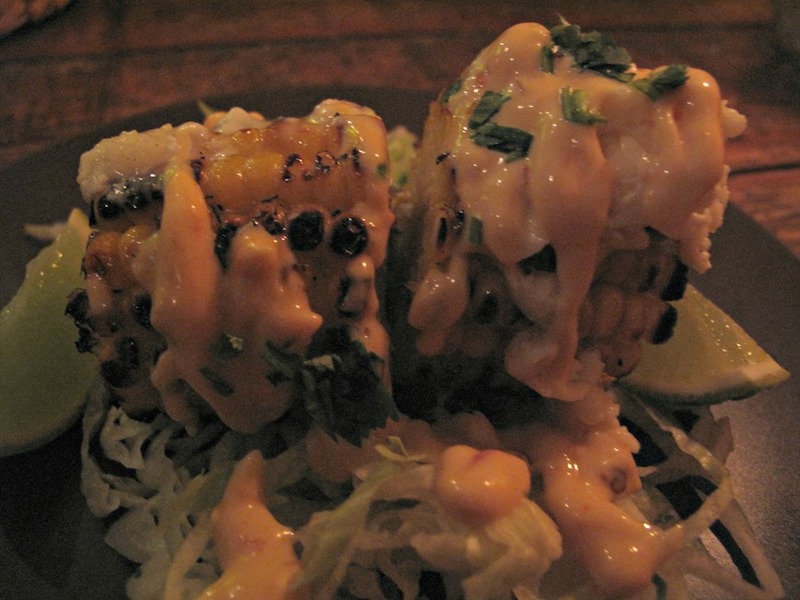 First though we start with “street style chargrilled corn” with chipotle mayo, queso fresco and lime ($5). Our single serve cut in two lasts all of about five seconds. It’s yummy but oh-so-very small! 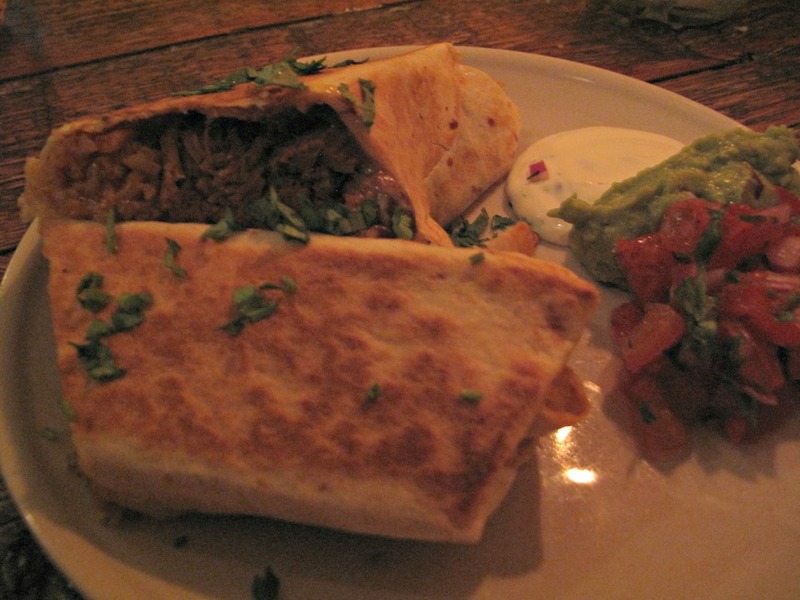 Bennie’s beef burito ($14) is a big step up from the same item ordered by me on that initial visit. This is much more deftly done with none of the solid if enjoyable stodginess I experienced. 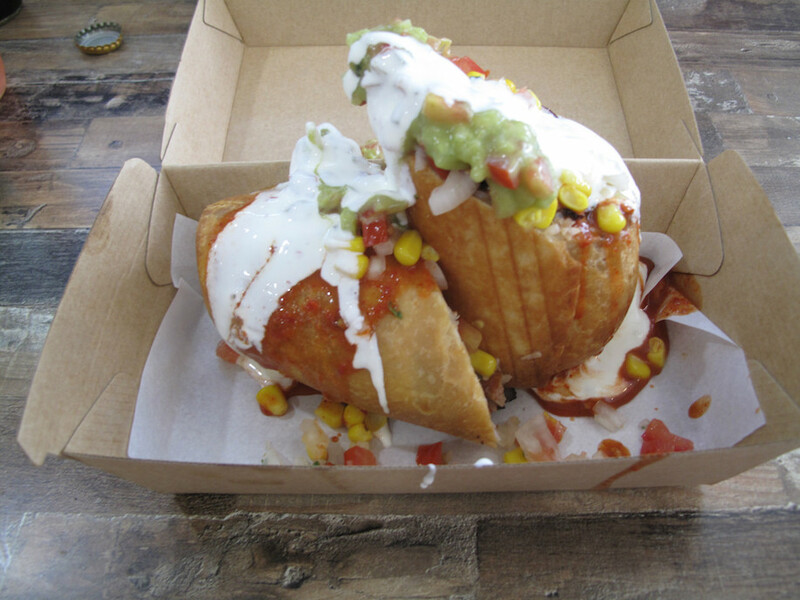 The filling has very nice shredded beef and there’s salsa, sour cream and guacamole on the side. But the real eye-opener is the nachos ($13). I’m not sure why I order this, as nachos can so often veer between acceptable bar/snack food for sharing and a gloopy, unappetising mess. 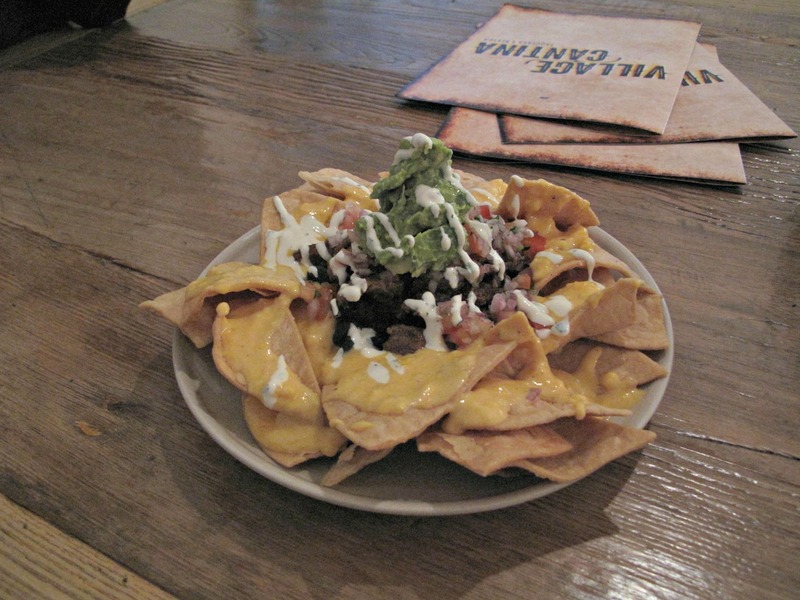 The new-look Village Cantina nachos has real good melted cheese, guacamole, black beans and salsa in great profusion atop a big mound of good corn chips. But this nachos is lifted to a whole ‘nuther level by the fabulous strips of grilled chicken that have tremendous flavour and a bit of a cajun thing going on. It’s the best nachos I’ve ever had. 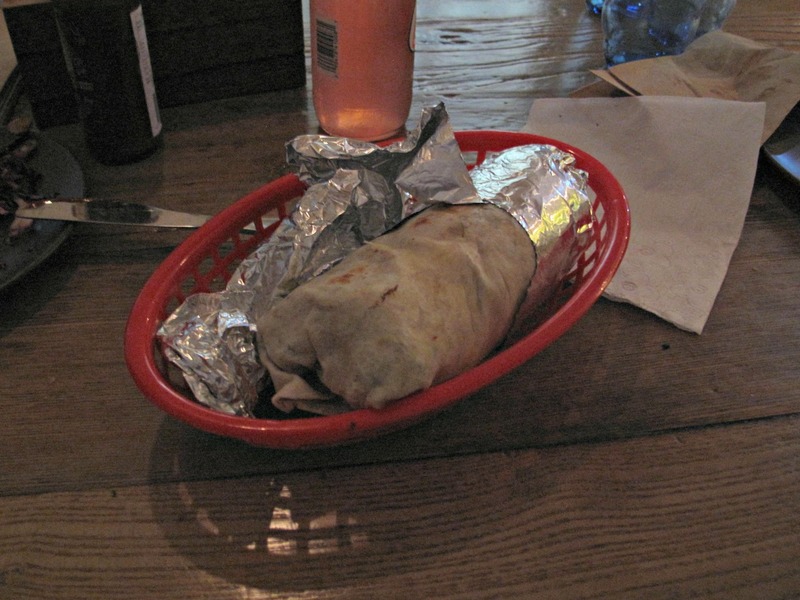 There’s so much of it – and its tastes so good – I’m happy to fully share with Bennie once he’s done with his burrito. Heck, it’d make a fine light meal for two! Barely a week after Village Cantina’s opening, Team CTS descends on the joint for a taste of what it has to offer. It’s busy as all get out. Wait time is prolonged but the staff do their best. We recommend, while the place is so busy with folks checking it out for the first time, that the best times to visit are early or late. The expectations and hopes of we three are quite finely calibrated. We don’t expect the authenticity of La Tortilleria. OTOH, we’re hoping for something better and more enticing than what is offered by the likes of Salsa’s or Guzman y Gomez. Sometimes – like right now! 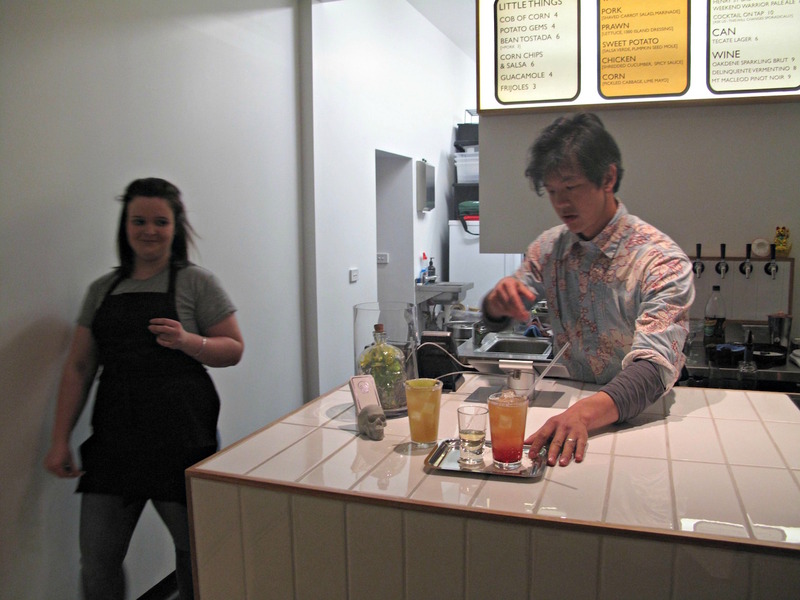 – Mexican food through an American prism is just the ticket. That’s exactly what we get. But … it’s very good. Much better than we expect! 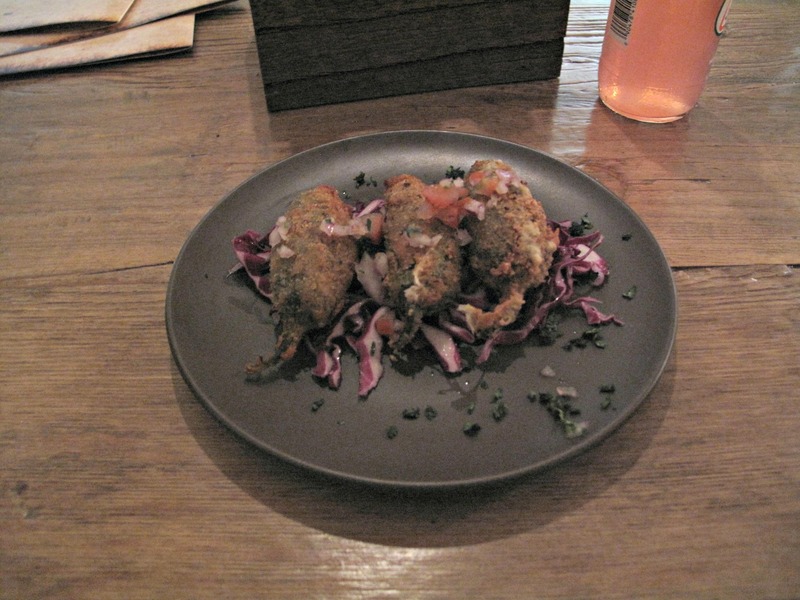 Jalapeno poppers ($6 for three) are wonderful, with gooey cheese centres and breadcrumb coatings. They’re spicy, too. 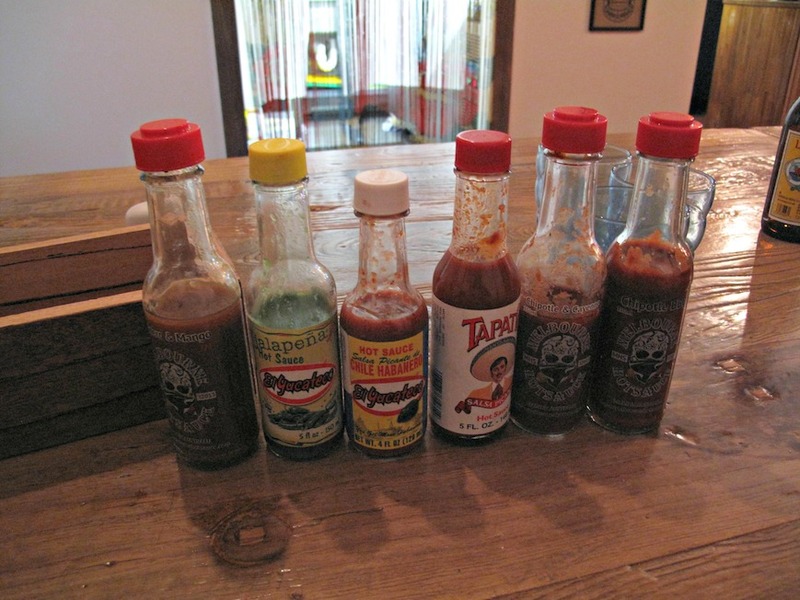 Much hotter, in fact, than any of the array of hot sauces at hand. We try them all just to make sure! 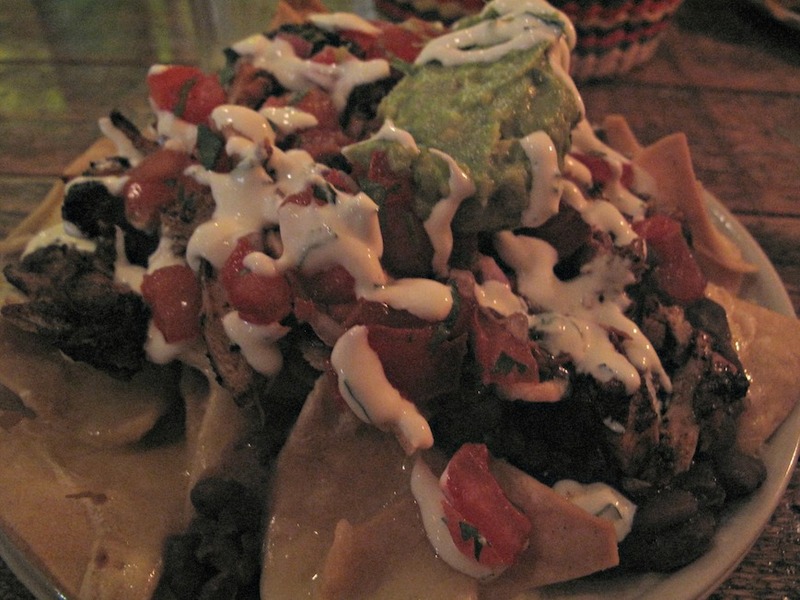 Instead of fiddling around with a bunch of other entrees, we go for the nachos ($12), which is another winner. That the beef is shredded and lovely, rather than merely ground, is testament to the fact that Village Cantina is staking out the high ground when it comes to this sort of food. My beef burrito ($13) is good, with the cheese shining out amid the other ingredients – rice, black beans, salsa and shredded beef. It’s solid, satisafying and enjoyable. But I do look with envy at the selections chosen by my companions – they appear both more interesting and more refined. The bloke who chose the pork quesadilla ($12) is very happy indeed. Fish and pork tacos ($6 each) also hit the spot, with their recipient telling me the former has good, crisp and solid chunks of fish. Our dinner, including three Mexican soft drinks, has cost us precisely $65. And that, we reckon as we very happily depart, is a bargain. 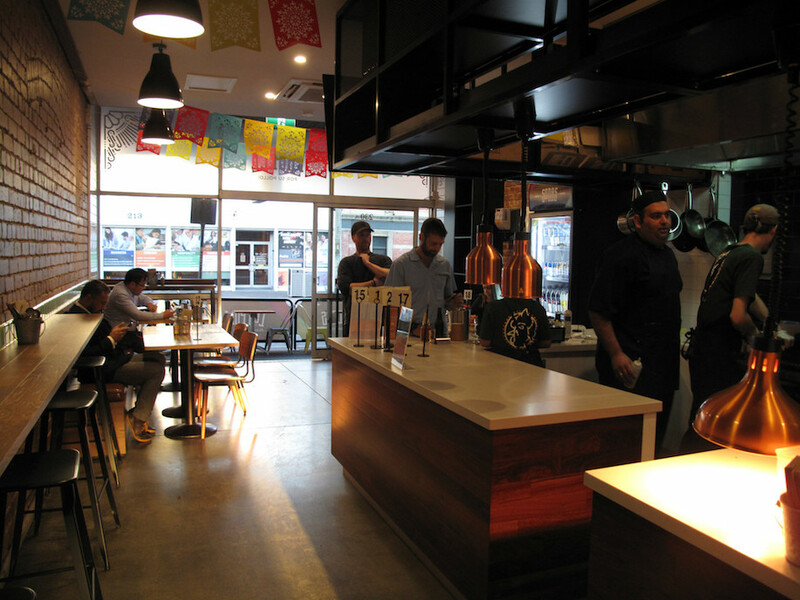 Mexican in Yarraville – it’s open! 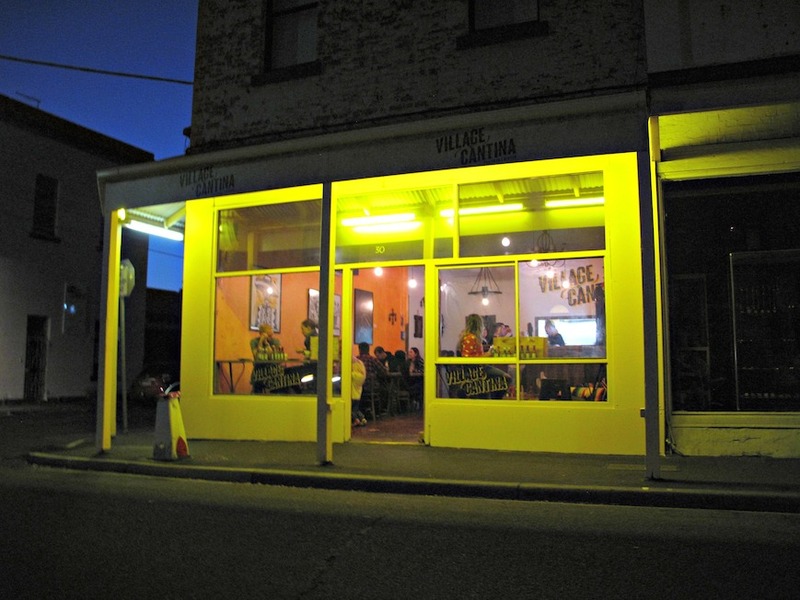 By the time I discover Village Cantina in Ballarat Street is up and running, it’s too late – I’ve already had an at-home dinner! So this post is more your newsy story to alert readers to the opening and the subsequent rise village diversity. We’ll no doubt be taking the menu for a test drive very soon and will write about the food then. 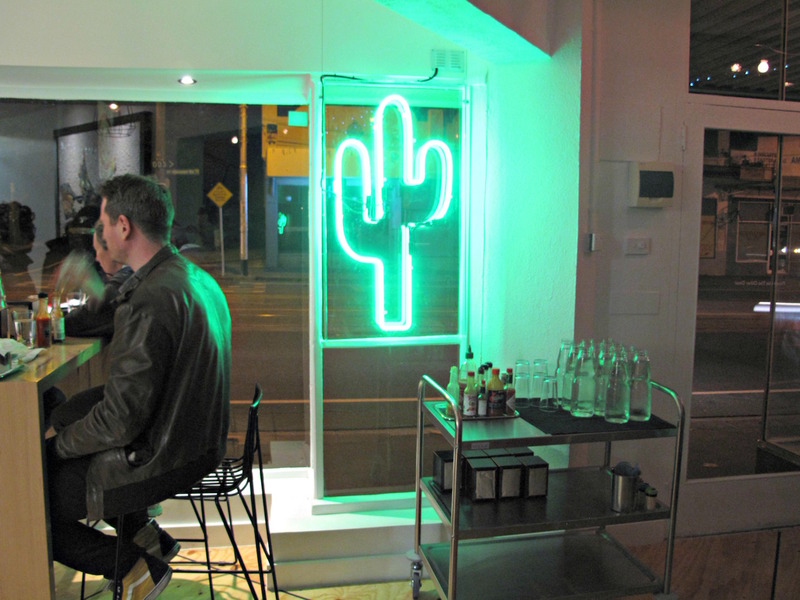 The place is done out in colourful cantina style with some nicely cool art works in place. They’re busy even just an hour after opening. 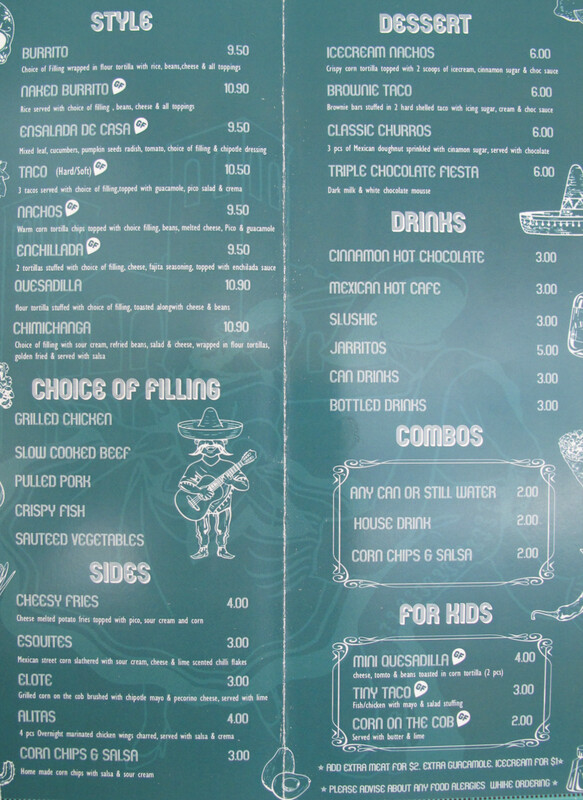 The compact menu doesn’t get in the least bit adventurous or weird – here you’ll get grilled corn, tacos, burritos, quesadillas, nachos and churros. 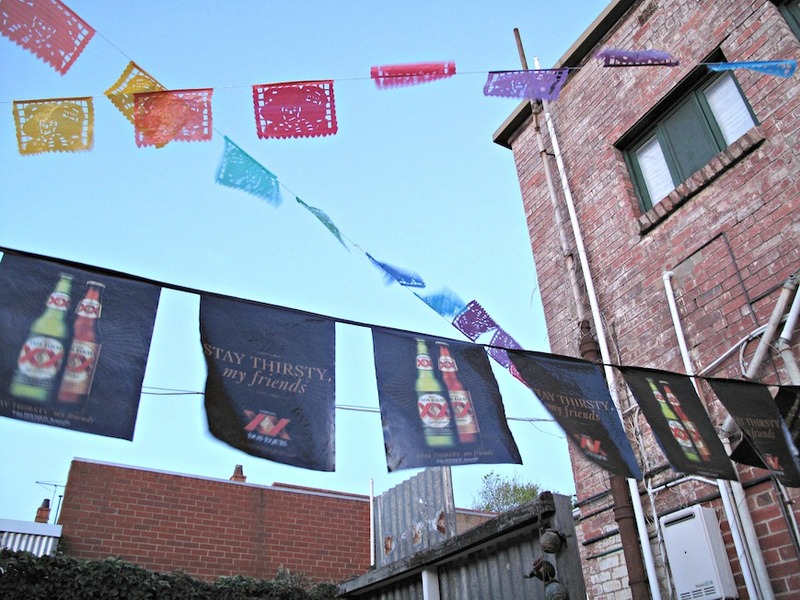 On the other hand, the tortillas are being supplied by El Cielo of Port Melbourne, so the quality should be there. 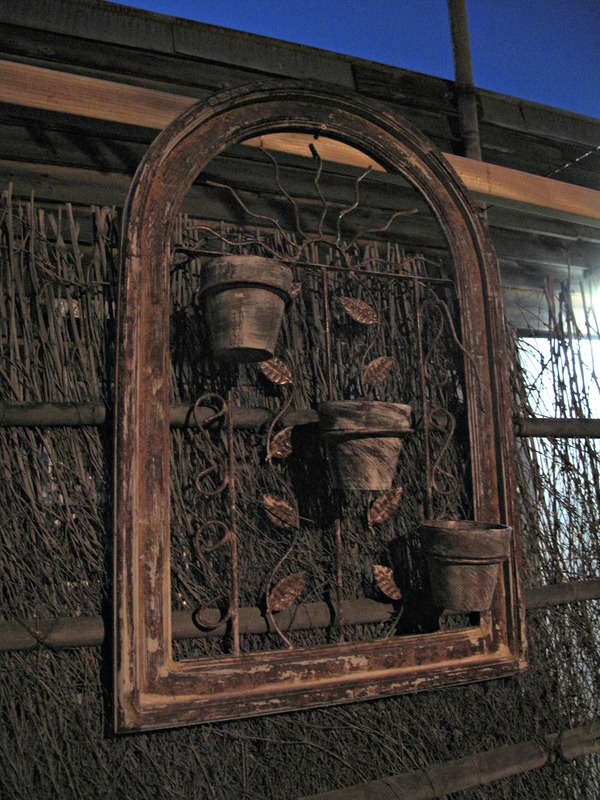 Out back, there’s a three-table funky garden for chilling out purposes. 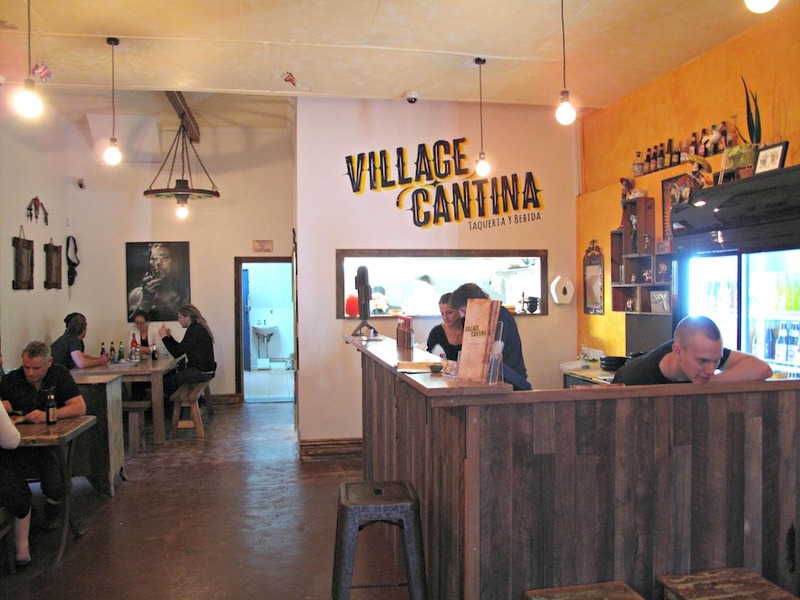 For opening hours, check out the Village Cantina Facebook page.